For the young woman who desired a vegetarian lifestyle since the age of nine, Saint Martin’s Residence Director, Ella Shepherd, has evolved into an environmentally conscious expert. In August, Shepherd decided to challenge herself with the Zero Waste Lifestyle by converting her waist-high garbage can into a recycling bin, composting as much as possible, and most significantly, stuffing any non-compostable, non-recyclable items into plastic water bottles. The experience has opened up endless avenues to further her dedication to limiting her footprint on this Earth. Using her aunt and a useful online blog as her guide, Shepherd has immersed herself in the countercultural means of living that focuses on minimizing the wasteful tendencies of human beings. Shepherd is no hippie. Growing up in Florida, her surroundings consisted of processed foods and a rising obesity rate. Always a conscious consumer, Shepherd constantly sought ways to reduce waste. In high school, while driving back from lunch one day, she witnessed someone throwing their trash from McDonalds out the car window. She proceeded to pick up the bag and return it to the owner, letting them know they “must have dropped their trash.” Concerned with the careless attitude of many people, Shepherd hopes that others will gain awareness of how our consumer tendencies damage the environment. Unfortunately, a certain stigma exists about those who try to preserve the Earth. “Caring about the environment makes you a hippie,” explains Shepherd, but even with this hurdle of a mindset that humanity must overcome, she still has hope for change. While people used to grow and cook their own food, we now live in a world complete with packaged food and frozen dinners. As more people acknowledge the rising levels of illness, disease and obesity in our society, she thinks we may slowly drift back into that self-sustained living that was so prevalent in generations before. Although filling plastic water bottles with trash seems more difficult than simply throwing garbage in a large trash bin, Shepherd thinks the Saint Martin’s community could easily get more involved in some sort of environmentally friendly regime. 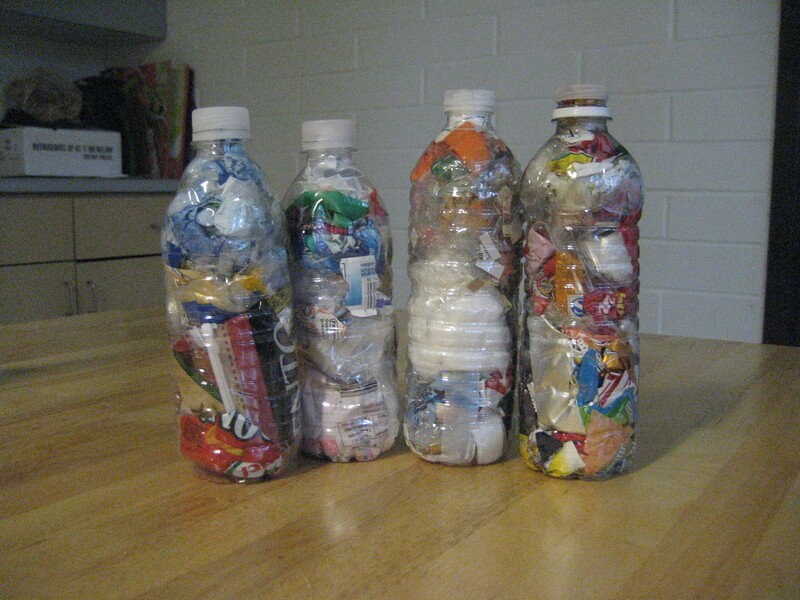 Surprisingly, the transition to a Zero Waste Lifestyle seemed natural and easy for her. For college students, the dining hall makes this lifestyle relatively simple. The central problem Shepherd and many others face is the lack of time to prepare everything from scratch. The visual display of water bottles filled with trash shows just how much unnecessary waste exists. Shepherd’s aunt first inspired her to take on the water bottle challenge and to no longer have to take a trash bag out twice a month. Now, Ella fills plastic water bottles with what little trash she has in hopes of reducing her trash amount as much as possible. She plans to send the trash-stuffed water bottles to her aunt in Northern California who will use them as an addition to her house. Since the garbage is not biodegradable, her aunt wishes to make some use of it, while keeping it out of the landfill. On the easy-to-follow blog that Shepherd follows, http://zerowastehome.blogspot.com, where the motto is to “Refuse, Reduce, Reuse, Recycle, Rot,” the founder, Bea, displays a tiny bag of trash that her family of four produced in four months time. Although Bea practices the Zero Waste Lifestyle quite extremely, her blog has many tips and recipes for anyone to try. Additional motivation for Shepherd came from the book “Seven”, where a woman “fasts” in seven areas of her life for one month each. Shepherd’s inspiration came from the sections on minimizing stress, possessions, and packaged food. Living in the Olympia area further supports Shepherd’s lifestyle choice. Olympia provides countless opportunities for people to help lessen their footprint. Shepherd often visits the Eastside Food Co-op in Olympia where she brings her own containers to purchase goods in bulk. With such an environmentally conscious city in such a progressive state, Northwesterners could encourage a nationwide change in the ways we view consumerism and waste. Saint Martin’s Bon Appétit has a commercial composting bin behind the dining hall in which Shepherd disposes of her compost once every other week. When she considers the lifecycle of a product and how long it will last, it helps her make a decision as to whether or not she needs to purchase the product. Considering the durability of the product, and the actual necessity of the product helps her reduce as well. Shepherd would love to see the Saint Martin’s community join her in her mission to reduce her footprint, and she says a good place to start for students is cutting out the usage of plastic bottles and plastic bags. Although she admits at first, the concept of using water bottles as a disposal seems weird and a little crazy, it feels good knowing that she is doing her part at preserving, and extending the existence of our environment. Alternative Building: Can water bottles really provide a supportive structure for living?